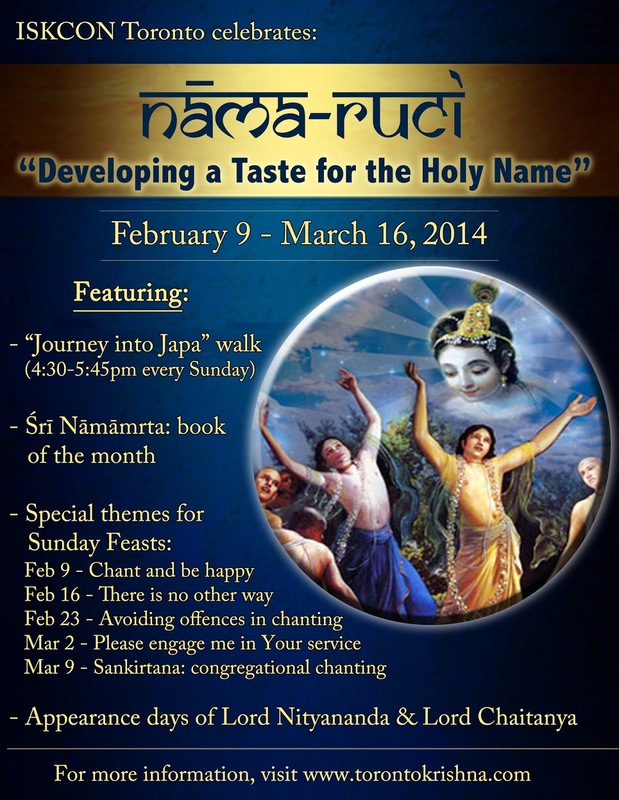 "Nama-Ruci" Month: Developing a Taste for the Holy Name ~ The Toronto Hare Krishna Temple! Every Sunday, between 4:30 and 5:45 pm, we invite you to come and experience "Journey into Japa", a sanctuary for everyone to enliven their chanting. The sanctuary will have 108 lotus flowers to guide your walk through one round of japa, accompanied with Srila Prabhupada's sublime chanting in the background. February 9 - Chant and be happy: Mantra meditation has now become extremely popular as more and more people have taken this age-old practice. Let's find out why and how mantra meditation can help you become a happier person. February 16 - There is no other way: The vedic scriptures prescribe many different ways to achieve the perfection of life. Let's explore why in this present age of Kali, there is no other way except the chanting of the Holy Names. February 23 - Avoiding offences in chanting: Chanting is most effective when done offencelessly. Let's learn how we can improve our chanting by avoiding offences. March 2 - Please engage me in Your service: What are we really saying when we chant the Hare Krishna mahamantra? Let's dive deeper into the meaning of this great mantra. 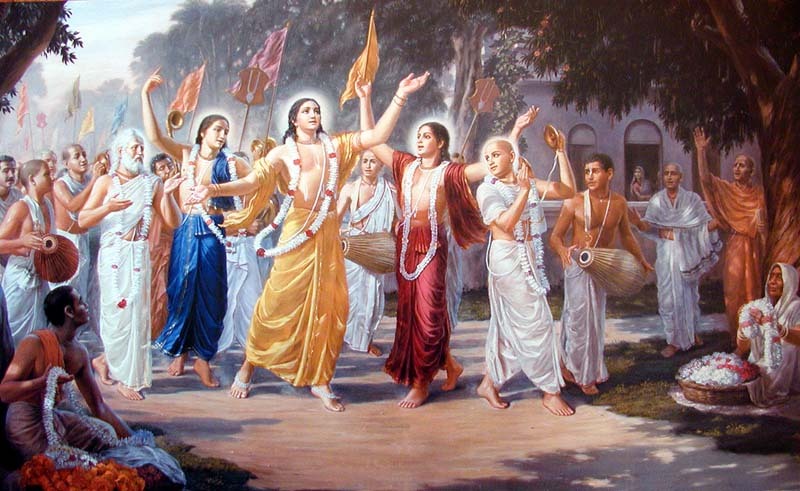 March 9 - Sankirtana: The incarnation in the Age of Kali is Lord Chaitanya Mahaprabhu, who spread the worship of Krishna by the sankirtana movement (congregational chanting of the holy names. Let's understand why Lord Chaitanya declares Sankirtana as the life of all transcendental knowledge. If you are new to mantra meditation, we welcome you to join Uttamananda Krishna Das as he leads a warm and friendly session of chanting on beads at 7:40 pm every Sunday. We will also have japa kits available to facilitate your nascent chanting experience. For the month of February, the Toronto Sankirtan Book Club will be reading the book "Sri Namamrta - The Nectar of the Holy Name." If you would like to read along and don't have a copy, you can get a copy of the book of the month during the Sunday Feast. To register for the book club, email toronto.sankirtan@gmail.com. Please don't forget to mark Wednesday, February 12 and Sunday, March 16 in your calendar as the appearance days of Lord Nityananda (Nityananda Trayodashi) and Lord Chaitanya (Gaura Purnima). More details will be posted shortly on our blog about the festival program. We wish you all a blissful month of chanting! May the taste get sweeter!